So.... *spoiler alert*, I was a little confused when Maggie couldn't be found. 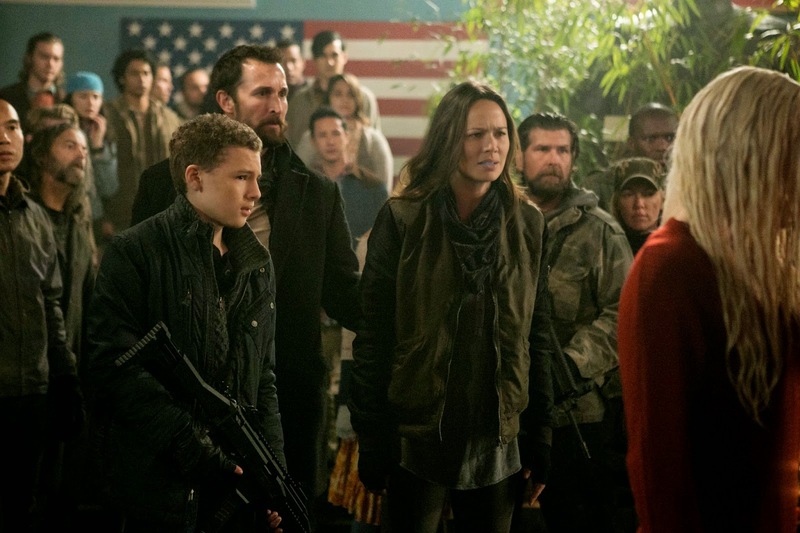 I wasn't expecting her to die, given the large portion of the Falling Skies Comic-Con panel devoted to talking about the love triangle on the drama, but the preview for the next episode suggests that she's just lost the use of her legs. That's still a big deal and will probably cause extra contention that the 2nd Mass doesn't need, but with the other casualties this episode, I am glad they haven't completely wiped out the characters we know and root for, even if we don't love them, per se. I know that sounds a bit ruthless, but if you stop to think about it, the series really hasn't done a fantastic job in making you genuinely care for the characters... as least not in recent seasons! Another invasion seems to be upon them, and the 2nd Mass checks out the real-time troops map, asking Cochise for help. His team buys them about twelve hours by blowing up a bridge, but that seems to be all they can do. Sara wants to flee to Florida, but Pope wants to keep killing aliens. [yeah... that's still all he's living for, I guess.] Some of the more brainwashed young adults stand in a line, intending to show that they mean no harm and believe they will be spared, but they're soon shot by the Espheni. [that should have been a tip-off that a bloodbath would soon follow.] At least 70 people die in the first battalion's fight, including Dr. Kadar, who gives Anne Lexi's blood samples, apologizing that he wasn't able to save her. [eh. he wasn't that great of a character anyway.] Tom wants to play opossum for the next wave of Espheni, so the remaining survivors go underground, except for Maggie, who is missing. Tom also stays above ground, with the intent to do some shooting, but another guy knocks him out and acts as a kamikaze sniper to wipe out some aliens.